Our basic species list was compiled by the high-school-age group in 1971, with additions being made right down to the present day as we discover isolated individuals of young, apparently new trees like Gray Birch and Amur Maple. In 1994, we sought out the biggest individual of each species (measuring only the diameter of the trunk). This very limited, single measurement allows comparison with what is known to be possible. Our biggest Butternut and Red Ash trees (both now dead and fallen) closely matched the records set out in the Honour Roll of Ontario Trees, whereas the biggest we have for all our other species are much smaller than the province’s best trees. That probably has to do with our two record-sized trees growing on rich, well watered soil in full sunshine, while the rest are on thin, stony soils, as well as the settlement and fire history. With two tiny exceptions, our Study Area was burned over in the Great Fire of 1870. Essentially, no tree here can be older than 145 years — or so we thought. In the late summer of 2006, the discovery of certain old-growth indicator lichens (genera Calicium, Chaenotheca, and Chaenothecopsis) led to the recognition of a few acres of unburned cedar swamp. Several of the cedar trees, which have pale grey bark almost an inch thick, appear to be more than 150 years old, but because they are hollow, we can’t be sure. The other exception was discovered in the summer of 2015, when one of our Study Trees (Hugo Kitching’s “Holey Ash”) snapped off 35 feet above the ground. The annual rings revealed in the fallen top looked very narrow (< 1 mm) so Rob counted them. They showed that after the tree had reached a height of 35 feet, it lived for another 145 years. Its full age might have been 180 years. The bark on the Holey Ash had always appeared different from other White Ash trees of similar size — the ridge tops had worn away, and the flattening made it resemble a Basswood. In that corner of the Study Tree Woods several of the biggest Sugar Maples also have curiously balding bark, and growth forms that are reminiscent of old-growth trees. But they are all hollow, and cannot be dated. Still, if one White Ash survived the fire of 1870, it is reasonable to think that other trees close by did, too. Otherwise, since we are really dealing with second-growth forests, in which most trees have a long way to go before they approach in size what is possible for their species, measuring diameter at long intervals should show that the largest keep getting larger. We are seeing this to be true with Eastern Red Cedar, Balsam Fir, and White Poplar. The very reverse, however, is observed in species being killed by introduced diseases — Butternut and White Elm. In 45 years, only 3 specimens have been found. Two were little more than knee-high, and one, at least, was removed by persons unknown with a shovel — back in 1973. The one tree that was too big for that was long lost to view among other growing conifers for many years, but was relocated on Dec. 4, 2010. Eastern Red Cedar is at the very northern edge of its range in Ottawa, and so should not be expected to be a common tree here, the way it is along Hwy. 401 near Belleville. In 1988, members of the Macoun Club’s Junior group surveyed the whole Study Area, and produced a map of this species’ distribution. It seemed to favour the cool margins of conifer forests, especially where water seepage at the foot of slopes made the soil quite moist. The trees were planted in rows, behind a tractor. Where soil was thin, it was heaped up in plow furrows first; otherwise, the seedlings were popped into a slit cut by a disc in the sod. After 25 years, the Ministry of Natural Resources started sending crews in periodically to thin the plantations, which otherwise become overcrowded as the trees grow bigger. The original aim was to produce a commercial crop of trees, but priorities have changed, and some areas are meant to be developed into natural-looking forest. Quite apart from the plantations, a small population of “wild” Red Pines exists in mixed forest near the hydro corridor in the south. A variety of ages is represented, including trees bigger than any planted elsewhere in the early 1960s. In 1974, Macouners noticed what looked like an apple nursery far away on the northern edge of the Study Area. Little trees about half as tall as a man had been set out in neat rows. 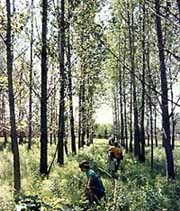 We ignored them for 14 years and when we finally took a look (photographed in 1988), they had grown up to be poplars, rapid-growing species intended as an experiment in wood production, for fibre. The biggest are now about 22 inches (45 cm) in diameter! Many have since become badly diseased with cankers. Two varieties, intermixed, appeared to be present. One of them has the smooth, green triangular leaves of Eastern Cottonwood; the other, with leaves that are downy and white below, we now recognize as the European species, White Poplar (Populus alba). This tree is widely thought to have little potential to spread into the natural environment because the solely female trees aren’t supposed to produce seeds. It should spread only by sprouts arising from the roots. But our finding of seedlings, saplings, and small trees as much as 700 metres (nearly half a mile) from the plantation indicate that seeds are being produced. The White or American Elm had been one of the more important trees of open places, swamps, and even forests when the Macoun Club began investigating the Study Area in 1970. At that time it was already dying in great numbers from Dutch Elm Disease. This was a fungus that, having been introduced from the Old World, swept through almost the entire elm population of the continent, killing more than 99.9% of the mature trees. The fungus is carried from tree to tree by tiny bark beetles. Even now, 40 years later, the disease is steadily killing the ever scarcer survivors. The other elm species are also susceptible to the disease, and being scarcer to begin with, they are that much harder to find now. As long as they stood, the dead hulks of disease-killed elms provided a bonanza of nesting and roosting holes for birds and mammals. We have seen them used by Tree Swallows, Grackles, Wood Ducks, Pileated Woodpeckers, and Flying Squirrels. But as the rotting stubs topple, there are no replacements. This is a small tree by nature, and our Striped Maples were even smaller. Almost all specimens were waist-high, and all were struggling against an unknown fungal canker disease. The bark on the stems died and darkened, become shrunken and shrivelled. The little trees were dying, and most were last seen alive around 1997. There never were more than a dozen in all, and only one had survived through to 2008. It was crushed flat by a falling tree that year, and having been laid low, its leaves were eaten by deer. All were in one corner of the woods where we have our study trees. All photos donated or provided by members and leaders, past and present. Created May 2002, and updated Apr. 17, 2011. Butternut section updated June 4 and Mar. 29, 2004; White Poplar section on Feb. 9, 2010; Red Cedar section on Dec. 5, 2010. Coding revised in 2012 and 2016.